Kaori Toda - Website of Anima Concordia! After graduating from the Tokyo University of Music and Fine Arts in Tokyo Kaori turned her attention to baroque music and started performing actively with the major chamber music ensembles in Japan. On winning the first-prize in the Yamanashi Early Music Competition in 1992 she moved to Europe to study under Sigiswald Kuijken and Elisabeth Walfish at the Royal Conservatory of the Hague in the Netherlands, specializing in baroque violin and obtaining her diploma in 1996. Later on she joined La Petite Bande, and Les Talents Lyrics, having toured and recording throughout Europe and South America. 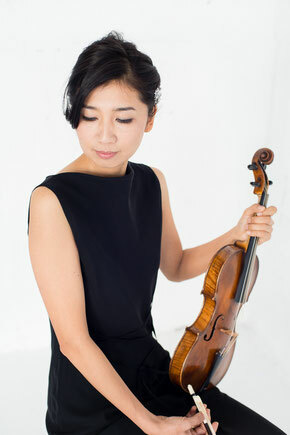 An enthusiastic chamber music violinist, she has appeared in chamber concerts with artists such as Andreas Scholl, Agnes Mellon, Francois Fernandez, Jos van Immerseel and the Kuijken Brothers. A founder member of the Bach Collegium Japan and member of the team to record the complete cantatas of J.S.Bach, she is currently the concertmaster of the Classical Players Tokyo. Together, with her husband Paul Herrera, she founded the Anima Concordia Ensemble, focusing on the duet repertoire and the trio sonata. The ensemble performs concerts and recitals in music festivals as well as teaching in seminars and lectures in Japan and overseas. Their cd of the complete sonatas for two violins Op.3 & Op.12 from Jean-Marie Leclair has been highly acclaimed. Kaori Toda also teaches baroque violin and chamber music at Toho Gakuen University in Tokyo.